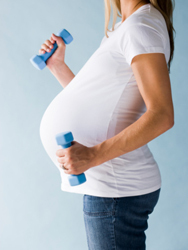 Exercise during pregnancy can be very beneficial as it will build up your stamina and improve your strength. During pregnancy and childbirth you body undergoes extra demands, exercise will help you cope with this. Exercising also gives a surge of oxygen into your baby’s blood that affects its metabolism, making your baby’s tissues especially the brain function in top form. Exercise is a great way to lift your mood, help you relax and become self-aware of your body in its new form. It can also help to ease leg cramps, constipation, backache and breathlessness, plus you will find that you have much more energy. Of course exercise will help you to get your pre-pregnancy figure back much more quickly after birth. As long as you take precautions when exercising and know you and your baby’s limits you can maintain your fitness throughout your pregnancy. 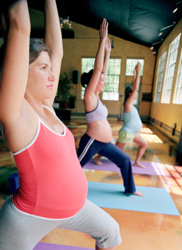 Here is some information that will help you exercise safely while you are pregnant. There are limitations put on exercise frequency and intensity that should be understood for the benefit of your developing baby. You can handle exercise much better than your baby therefore it is best to avoid high intensity exercise and for shorter periods of time. 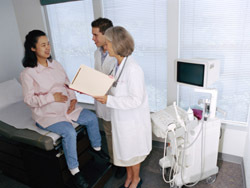 Research indicates that when a mother’s heart rate reaches 180 bpm frequent fetal distress is common. Change to a lower pace exercise program with less impact and use less vigorous arm movements. Check your heart rate frequently maintaining 140 bpm, taking regular breaks ensuring that you warm up and cool down, stretching gently. After you finish your exercise have a drink, move around and cool down. Exercise for short periods of time, cutting back your regular exercise routine. After week 28 of your pregnancy avoid frequent and prolonged exercise. Even moderate exercise has been associated with decreased birth weight and gestation duration. For the same reason that you should avoid hot baths, spas and saunas when pregnant, ensure you do not become overheated when exercising. Your baby does not have your same ability to dissipate heat and therefore you may put your baby at risk if you overheat. This is extremely important during the first trimester when the baby is developing and the most important growth and formation is taking place. To avoid overheating during exercise, take frequent breaks throughout your workout, exercising for no more than 20mins. Drink plenty of water before, during and after your workout. Do not allow how much you sweat to indicate how much water you should drink. Your temperate can rise long before you begin to show any signs of perspiration. Make a habit of drinking the entire contents of a water bottle while you exercise. Wearing light, loose clothing during exercise can help to keep you cool and avoid exercise on hot, humid days. Use fans to keep cool and keep your core temperature at a safe level for your baby’s well-being. Below is a general guide to the exercises to avoid when you are pregnant, however if at any stage during your exercise sessions you feel hot, faint, dizzy, short of breath, experience vaginal bleeding, have palpitations, blurred vision, disorientation, severe or continuous headaches, STOP EXERCISE IMMEDIATELY!! You should also monitor your health and if you notice any lower abdominal pain, tightness or cramping, back pain or pubic pain then stop exercise. If you have any of these symptoms you should speak with your obstetrician and seek advice. Do not do full sit-ups at any time during your pregnancy. If you continue to do crunches or abdominal exercises it is recommended that you support your abdominal muscles, crossing your hands over the abdominal area. The separation of your abdominal muscle should be checked regularly by your obstetrician as about 30% of women during pregnancy can experience a separation of the rectus abdominus. If this does happen or discomfort occurs, all abdominal exercises should stop. You should limit the amount of exercises you do laying on your back, especially from your second trimester and on. When you lie on your back when pregnant it can significantly reduce the blood flow to your heart and head which of course can cause you to feel faint or lightheaded. Consequently the blood flow can be reduced to the placenta and baby. Spend no longer than 2 to 3 minutes on your back and if you do happen to feel lightheaded, roll onto your left side until feeling better. Avoid using hand weights over 0.5 kgs in weight during exercise classes while pregnant. Heavier weights have been connected to an increase in heart rate to higher than 140 bpm. If you experience pins and needles in your hands you should avoid all hand weights. Heavy strength training should be avoided as well as isometric contractions and holding your breath. Do not perform lunges or squats while pregnant, these can lead to back and/or pubic pain. Resistance training with low weights is a good alternative to strength training as it has more emphasis on endurance and using repetition. As your body changes shape during pregnancy, so does your centre of gravity that can affect your stability, coordination and balance. Any exercise involving rapid directional changes or lots of twists and turns can put you at risk for injury and should be avoided. Due to your change in centre of gravity, step or pump classes should be kept to a minimum and be very cautious, preferably working on a lower step height or larger platform. If you do decide to continue with your pump or step class keep to less complicated classes and do not use weights. After you begin to show, in particular the second and third trimester, these classes should only be performed by experienced pregnant exercisers and with extreme caution. If you have never done pump or step classes, during pregnancy is not the time to start! Wear a good and supportive bra during exercise to help provide the additional support for your enlarging and possibly tender breasts. Stretch gently before and after all exercise. When pregnant a hormone called relaxin is increased in your body and can increase joint laxity which may make you more prone to injury. You should be cautious and gentle while stretching. Focus on pelvic exercises to strengthen your pelvic floor muscles, these will assist during the delivery of the baby, better recovery after labour and help to prevent stress. Monitor your blood sugar levels, having a light snack 2 hours before exercise to prevent lightheadedness or faintness due to a low blood pressure during exercise. Carry fruit juice with you to your work out in case this occurs and remember to keep up your fluid intake.